Produced by Suriya himself, Suriya, Samantha, and Nithya Menen has played the lead roles in it. It also stars Girish Karnad, Ajay, Saranya Ponvannan, Sathyan, Mohan V Raman, and others and has been produced under the banner of 2D Entertainment. The 2-times Oscar winner AR Rahman has once again come up with mind blowing music. He is the sole reason why “Kaalam En Kaadhali,”Naan Un,”Mei Nigara” and “Aararoo” songs become chartbusters. Some particular names from the tech departments are Tirru and Prawin Pudi. They have brilliantly done their jobs with cinematography and editing respectively. The bilingual film made in Tamil and Telugu has created a positive vibe through the pre-released buzz which was eventually created by the massive promotions for songs, trailer, etc. Its teaser and trailer are the things which gave it so much attention. The highlights of the film include the vibrant visuals, Suriya’s performance, songs, etc. For the first time, Suriya will be seen in the triple role. Based on a time travel theory, 24 is a science fiction and deals with the idea that what a man can do if he gets the power to change the history. The film has been screened in India. Below you can find 24 critics reviews as well as audience response live from Twitter. Taran Adarsh tweeted: Now watching an exclusive screening of Suriya’s much-awaited Tamil film #24Movie [with English subtitles]. It requires courage, conviction, command over the medium and of course, financial strength to bring to life a film like #24TheMovie. #24TheMovie grabs your attention from the titles itself and for the next 2.40 hours you’re hooked on to this terrific roller coaster ride. The biggest strength of #24TheMovie is its concept. It also packs loads of entertainment and unpredictable twists and turns that win you over. 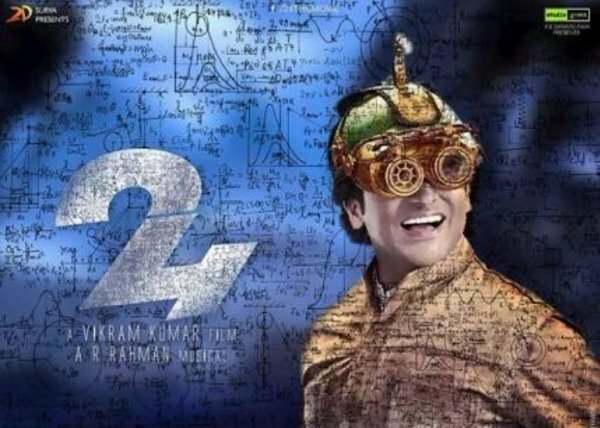 #24TheMovie is not just a good looking film but has lots to offer. Kudos to the team for pulling off the subject with élan! Have you watched the film? What’s your 24 Movie Review Rating? Feel free to share with us and join the discussion below. See what others have shared. positive reviews everywhere!! hope it will be career best movie for suriya!!! you are right bayya..naadi same dialogue..
guys please do not waste money boring movie. SUPER HIT MOVIE .SURYA ACTING AWESOME TAMIL ROCKSTAR . suuuuppppppppppppeeerrrrrrrrrr filmmmm surya Anne ki jaiiiiiiiiiiiiii.